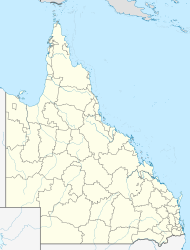 Boyland is a locality in the Scenic Rim Region, Queensland, Australia. At the 2016 Australian Census, the locality recorded a population of 823. Boyland's western extent is defined by the Albert River. In the east the slopes of Tamborine Mountain rise sharply to elevations greater than 500 m.
The area is named after the railway station which is in turn named after George Boyland, the chairman of Tamborine Shire Council from 1907 to 1908 and supporter of the Canungra branch railway. Boyland Post Office opened on 1 July 1927 (a receiving office had been open from 1915) and closed in 1945. There was a station at Boyland along the Canungra railway line, which operated from 1915 to 1955. In the 2011 census, Boyland recorded a population of 715 people, 52.4% female and 47.6% male. The median age of the Boyland population was 38 years, compared to the national median age of 37. 78.9% of people living in Boyland were born in Australia. The other top responses for country of birth were New Zealand 6.4%, England 5.6%, Guam 1%, Germany 0.8%, Netherlands 0.6%. 95.1% of people spoke only English at home; the next most common languages were 1.3% Italian, 0.6% German, 0.6% Czech. ^ a b Australian Bureau of Statistics (27 June 2017). "Boyland (State Suburb)". 2016 Census QuickStats. Retrieved 25 March 2018. ^ a b "Boyland (entry 45117)". Queensland Place Names. Queensland Government. Retrieved 11 April 2014. ^ a b Australian Bureau of Statistics (31 October 2012). "Boyland (State Suburb)". 2011 Census QuickStats. Retrieved 17 August 2014. This page was last edited on 25 March 2018, at 04:49 (UTC).